Oktoberfest is Wunderbar!!! Hey, we have an accordian in the band... so of course, we provide authentic german polkas, waltzes and Oktoberfest music!!! The Blue Waves are an award-winning Kitchener-Waterloo Oktoberfest Band! Come celebrate Oktoberfest with the Blue Waves, whether with us at the KW Oktoberfest or at another event we are playing at throughout Southern Ontario. 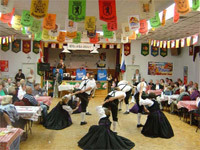 For KW Oktoberfest, the Blue Waves have played at numerous Festhalles, including the Western Fair in London and the Sava Club in Breslau. If you are looking for a band for your Oktoberfest Event give us a call. It would be our pleasure to entertain your group. Gemutlichkeit!